"The average runner out there, they think that things can just happen like that and it's not [like that], it's a series of years. It does take a lot of effort, a lot of work, and if we [Americans] keep on this path we're going to see more and more and have a big group of Americans competing at this level." - Matt Tegenkamp talking after he broke the 13:00 barrier with a 12:58.56 in Brussels on Friday night. Will Teg or Solinsky break 13:00 now that Ritz has? Anyone here ROOTING for Lagat to take the American Record in the 5000 away from Ritz? *IAAF Rieti Preview Asafa Powell is the big ticket in Rieti. London: *Cheruiyot Over Masai - Paula's Record Stands In Hyde Park 5k *Masai And Cheruiyot Headline Strong Women's Challenge 5k In Hyde Park On Sep 6 Paula Radcliffe holds the course record at 14:51. LRC Recap Bolt Does It Again In Brussels Usain Bolt thrilled a capacity crowd in Brussels on the final leg of the Golden League tour. He ran 19.57, but it was the enormous margin of victory and apparent ease that were so wonderful to watch. We recap almost every event, including a win for Anna Willard, 8:14 for Dan Huling, the oldest world record on the books going down, and 48.83 for Super Sanya as all three Jackpot contenders won. 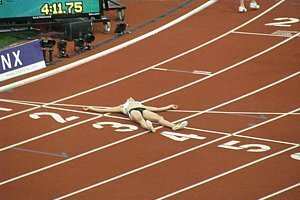 *Review The Brilliant Seasons Of The Golden League Winners Sanya Richards was incredibly dominant, ditto for Bekele, and Isinbayeva set a new world record in her up-and-down season that included a no-height at WCs. *Japanese Runners Line Up For Fall And Winter Marathons Promising young marathoner Kensuke Takahashi will run Berlin, while Yuri Kano will run NYC. *Over 300,000 Sign Up For Tokyo Marathon And 10k It's almost like you're in the minority if you aren't running a marathon. *JAAA Struggling To Provide Documents To Prove They Mandated Sprint Group's Participation In Pre-Berlin Camp If the Jamaicans succeeded in banning the six MVP track club sprinters from Berlin - a fiasco the IAAF prevented - they would have lost the men's 100m bronze, the women's 400m hurdles gold, the women's 100m silver and the 100m hurdles bronze. Boards: Here we go. Brussels 5,000m is NOW. Matt Tegenkamp joins Ritz in breaking 13:00 ... 12:58.56! Boards: Anna Willard Golden League win for Anna Willard in the 800m 1:59.14. Fantastic Bekele Quotes From IAAF He says "I have achieved everything." But before he retires he wants to tackle Daniel Komen's amazing 7:20 3,000m WR. He also talks about how good he feels after his short stint at altitude. Brussels Start Lists - Teg And Solinsky In 5,000m Will we see a new American record? Vote in the poll to the right. *Update: this might be the fastest-moving poll of all-time. 28% of voters see another sub-13:00 on the horizon. Bekele Spent 4 Days At Altitude In Ethiopia Between Weltklasse And Memorial van Damme Did the great Bekele have to go back to Ethiopia to get over the fact that Ritz was gaining on him in the final laps in Zürich? Big News That Should Not Go Unnoticed: Tyson Gay To Have Groin Surgery After Season Tyson Gay will run the 100m in Brussels against Asafa Powell while Usain Bolt will run the 200m. 4 x 1,500m World Record Attempt Taking Place In Brussels If the Kenyans send out a decent team, they could smash this 32-year-old record (14:38) set by the Germans, including Wessinghage. Good Drama: Burka, Wurth-Thomas And Cheruiyot To Chase Sonia O'Sullivan's 2000m World Record In Brussels Gelete Burka will run her first race back from her fall in the 1,500 final in Berlin. Vivian Cheruiyot will step down from 5k and go for Sonia O'Sullivan's 5:25.36 world record from 1994. Non-Running-Related Article On Sonia O'Sullivan That We Found Interesting O'Sullivan talks about how kids in Ireland don't play as much anymore because parents won't let them out of sight. Track & Field First? Bolt Reportedly Receiving US $500,000 To Race In Daegu, South Korea We understand paying a top marathoner a half a mil to run twice a year, but this is rarified air for a 10-second race. Daegu is hosting the 2011 World Championships (we can't get over what a bad idea that is), so the more excitement he brings, the better. *4 Golds In London? Bolt Says He'll Leave Event Decisions Up To Glen Mills While the headline claims Bolt will have a go at 4 gold medals in London, basically Bolt has said none of that. He does say he'd rather do the long jump than the 400m, but says preparation for 4 events will be very demanding. *Bolt Says He Will Not Consider Himself A Legend Until He Has Many Fast Cars There is a reason this guy is popular. LRC Ritz Speaks USATF held a teleconference with Dathan Ritzenhein Tuesday afternoon and we quickly give you the highlights. We tell you what Ritz had to say about new coach Alberto Salazar and what event Ritz will focus on for 2012. Plus we tell you what Ritz's next race will be. Is an American 10k record run a possibility? LRC The Week That Was This week we analyze Dathan Ritzenhein's 12:56 and try to tell you, "I told you so." We also argue that the IAAF would catch more drug cheats if they put the LRC community in charge and, lastly, we try not to forget Anna Willard and/or Shannon Rowbury. LRC: Dathan Ritzenhein Breaks Bob Kennedy's American 5,000m Record In Zürich Amazed? So are we. *2008 Nike XC Champion Reed Conner Wins By A Mile In First Meet For Badgers Impressive win for Wisco coach Mick Byrne's freshman. *Arkansas Razorback Solomon Haile Comes Out Of The Gate Strongly With A 23-Second Victory Over His Teammates *Video Of Solomon Haile After The Race Coach Bucknam and Solomon Haile spoke after the opening race. *Jacob Kirwa Gets Massive Win In New Mexico Jacob Kirwa smashed the field and Nicodemus Ngetich by 54 seconds. New Mexico season preview where they talk about how conference foe BYU should be worried about their team. LRC 12:58.56 For Matt Tegenkamp In Brussels It took only 8 days for Matt Tegenkamp and Dathan Ritzenhein to shatter the 13:00 barrier in an awesome 1-2 punch for American distance runners. Recommended Read: Kenny Moore On Andrew Wheating's "Out Of Nowhere" Quest To Become The Next Great 1,500m Champion Kenny Moore, one of our favorite running authors, wrote a long piece for Runner's World on the improbable rise of Andrew Wheating from soccer player in Vermont discovered by a former Nike exec to Olympian who is only just getting started. To read our review of Moore's "Best Efforts," click here. Brief Chat With Illinois Illini Runner Angela Bizzari, 3rd At US WC Trials In '09 NCAA champion Angela Bizzari couldn't quite qualify for Berlin after her excellent third place finish at USAs. She's looking forward to her senior XC season in Illinois. Bolt Vs. Bekele Match Race In The Works When and where? We are not going to miss this. They should have it in Beaver Stadium or the Rose Bowl and see if they can sell 100,000 tickets. 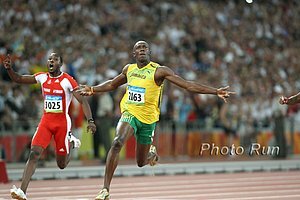 The most dominant sprinter and most dominant distance runner of all time are willing to run a match race at a distance between 600m and 800m in 2010. Their agents ... that may be a different story. Beijing 2008 - London 2012 - Rio 2016? Olympic Committee Issues Vague Report That Hints At "Rio de Janeiro 2016" What happened to the Obama magic for Chicago? We'll leave it to the Chicago political machine to "convince" the IOC to bring the OG to the US. Jamaicans Plead Guilty To Taking Banned Substance Jamaica wanted to let them go with no punishment but now it looks like they will get a "public warning." *LetsRun.com Homepage From 8 Years Ago HS senior Alan Webb was on the front page of the Washington Post and had just defeated Ryan Hall in a mile race, an email campaign was on to save UVA Men's track and message board posters were wondering if all the marathon courses in the '80s were short. *How 20 Popular Websites Looked When Launched They must have forgotten to add LetsRun.com to the world's most popular website list. *Return Of The Road Warriors! Sammy Wanjiru To Race Sammy Kitwara In Sep 13 Rotterdam Half Marathon The 22-year olds get to duke it out. Yes, they would be redshirt juniors if they were in college in the US. *Masai And Cheruiyot Headline Strong Women's Challenge 5k In Hyde Park On Sep 6 Paula Radcliffe holds the course record at 14:51. Berlin 5k champ Vivian Cheruiyot will race 2k Friday in Brussels and then 5k Sunday in London. *Former WR Holder Liu Xiang Could Compete In Shanghai Against Terrence Trammell It would be great to have Liu Xiang back in good form. *Oregon XC Kicks Off Season On Friday Several LRC voters have the Ducks at #1 but how will they do without Galen Rupp? *Oregon Releases The Most High Tech Media Guide In NCAA Running History Recruiting and media attention have been really tough for the Ducks, so hopefully this will help. USA 10km Trail Championships Were This Weekend In NC Princeton grad and steeplechaser Michael Spence won the men's 10k in just under 40 minutes. Must have been a bit of a tough course. 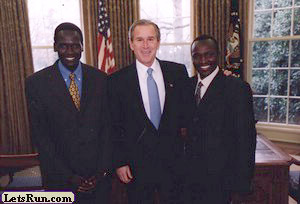 *Haile G To Race Duncan Kibet In Berlin On September 20 Geb has the WR at 2:03:59 and Kibet, thanks to the unbelievable Rotterdam Marathon in April '09, is the = second-fastest marathoner of all time with a 2:04:27. Maybe this will keep Rojo from blasting Geb for not racing anyone. *World Record? Princeton's Slovenski Brothers Clear 10' Pole Vaulting Off Unicycle Then they swallow fire and walk a tightrope over a pool of sharks.